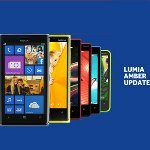 Today, Olivier Lagreou - Head of Devices from Nokia France update his status on twitter told about Nokia Lumia Amber Update is on the way to Nokia Lumia with Windows Phone 8. He said that "The Amber update starts to be be available! Go to Settings, update the phone and check the available updates", but no other information about the availability of the update for what models / region. Usually, Nokia will rolling out the software update gradually and depends on region, models and operators. The update will be available to be downloaded via Over the Air Update (OTA Update). So please be patient to wait until your update is coming to your Nokia Lumia with Windows Phone 8.